PPP2CA antibody recognizes PPP2CA, also known as PP2A-alpha, protein phosphatase 2A catalytic subunit, alpha isoform, or replication protein C.
Mouse anti Human PPP2CA antibody recognizes PPP2CA, also known as serine/threonine-protein phosphatase 2A catalytic subunit, PP2A-alpha, protein phosphatase 2A catalytic and replication protein C.
PPP2CA encodes the phosphatase 2A catalytic subunit. Protein phosphatase 2A is one of the four major Ser/Thr phosphatases, and it is implicated in the negative control of cell growth and division. It consists of a common heteromeric core enzyme, which is composed of a catalytic subunit and a constant regulatory subunit, that associates with a variety of regulatory subunits. PPP2CA encodes an alpha isoform of the catalytic subunit (provided by RefSeq, Jul 2008). 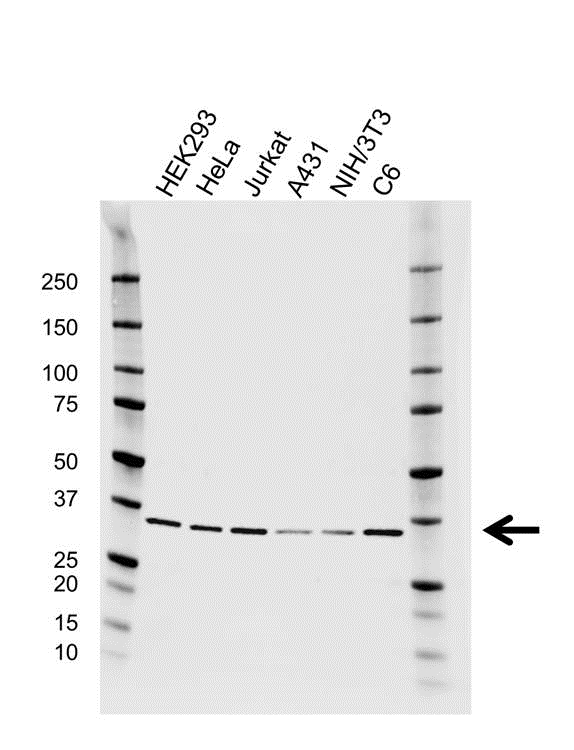 Mouse anti Human PPP2CA detects a band of 32 kDa. The antibody has been extensively validated for western blotting using whole cell lysates.